Tequila-spiked coffee? You betcha! This coffee cocktail from Quentin Ertel, owner of The Saint Social Club in Seattle, is perfect for livening up an ordinary cup of joe. Add the tequila and Kahlua to a glass and top with fresh, hot coffee. Fold the whipped cream onto top of drink. Dust with freshly grated nutmeg. Mix all ingredients in a bowl until firm. 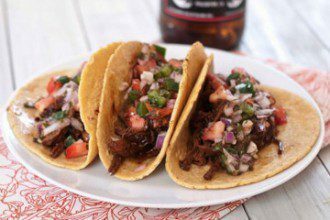 Dark beer is a surprisingly great addition to taco meat.